For a full overview of classes, workshops, and performances coming up, please visit our Online Class & Event Calendar. To see video of past performances, please visit our Deep Roots Dance YouTube Channel! Deep Roots Dance is thrilled to announce we will be an opening act for the Beats Antique Grand Bizarre tour in Seattle! Interested in including Deep Roots Dance in your next event? 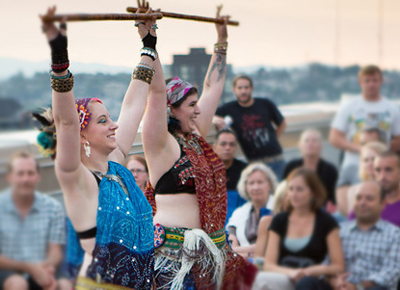 Tribal belly dance adds an exciting and unforgettable element to any gathering. Corporate events, bridal and baby showers, family fairs, festivals, and anything you can think of. Please visit our Booking page and let us know what you have in mind!